Playing this one was a BIG MISTAKE. I put it on and promptly stopped everything not for just an hour, but for several. It has stayed in the car being played over and over again for the journeys from home to the university and back each day for a week, and I'm still not tired of it. I've even given up listening to the World Service news. (Is Gaddafi still in charge in Libya?) A good friend, horn player Nick Smith, lent me a copy when we were planning a concert with the MPO brass, and so taken was I by the disc that I went out and bought my own. 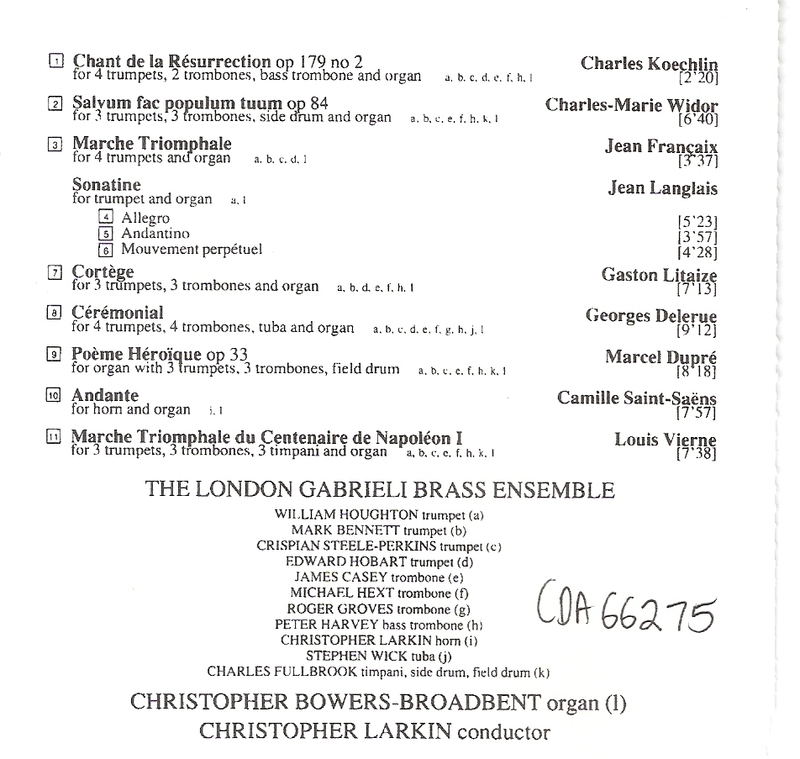 With the MPO brass we did the Widor and Vierne – spectacular in every respect – and planned to do the Françaix in the centenary year 2012; sadly the DFP pulled the plug on the organ concerts, so that will not happen now. No matter. 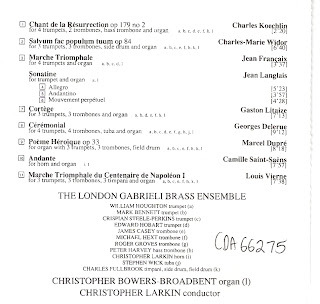 Christopher Bowers-Broadbent and the London Gabrieli Brass Ensemble do not so much pay it full justice in this sumptuous recording, but produce about the most spectacular disc of organ and brass I've ever heard. I could live without the miserable bits of Langlais, and the Litaize and Koechlin have little to offer, but who cares when the rest of this disc is so incredibly, amazingly, breathtakingly, glorious? Sadly, by the time Felix Aprahamian got round to writing the liner notes he was past caring, and his contribution is a model of pointless waffle. Yet he was one of the great figures in English musical criticism and what he didn't know about 20th century France just wasn't worth knowing. 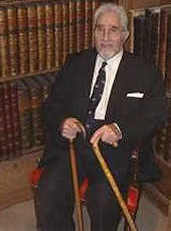 He remains one of my great heroes, in spite of a remarkable tendency to churn out drivel when the mood took him. I once confessed to an editor that I loved Requiems (which I do) and since then I've had an unbroken stream of them sent for review. This disc appeared in 2007 and is harmless enough. I don't take to the very dead sound or the rather precious style of delivery, and while there are some nice moments (there's a deliciously delicate little Tuba mirum with Grace Davidson trilling away merrily above some discreet string playing, while with a wonderfully full-voiced James Bowman and some enchanting violin playing from Kerslin Linder-Dewan the Liber scriptus is an absolute joy to behold) the performance doesn't really sell this music. 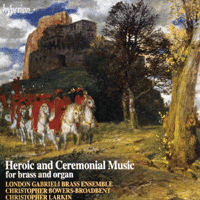 I yearn for a little more colour and variety; this seems to rely wholly on the fact that period instruments are used, and little seems to be done beyond that to convey what is, at heart, very lovely music. Fiori Musicali is an early music group founded in the English midlands in 1983 by its current Director, Penelope Rapson. They have released a number of CDs, most recently on the British Metronome label, the majority of which feature only their instrumentalists. Certainly these instrumentalists are a pretty impressive lot, as can be appreciated from the delectably tasteful playing in the mouth-wateringly appetising Lamentatio, a work in which they are providing rather more than mere accompanimental support to the incomparable James Bowman. With the other two works on the disc we are introduced to Fiori Musicali’s choral forces as well as an instrumental ensemble augmented by the presence of His Majesty’s Sagbutts and Cornetts. 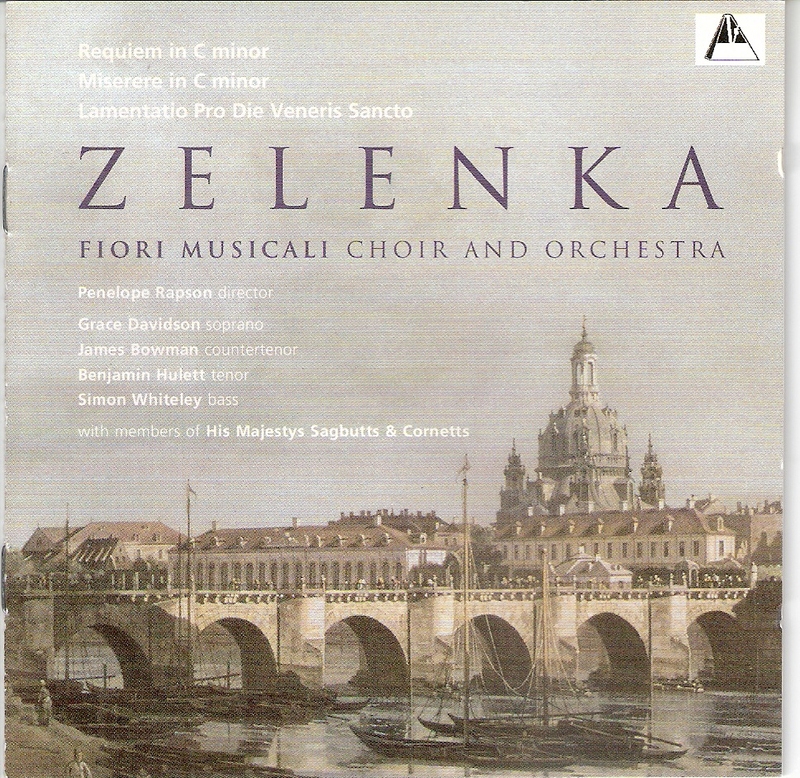 While Penelope Rapson is quite correct in claiming this to be the “first UK recording” of Zelenka’s Requiem (a work it seems was written not so much to mark “the passing of some great dignitary”, as the booklet suggests, but specifically the death of Emperor Joseph I), this is not the first time the work has appeared on disc. 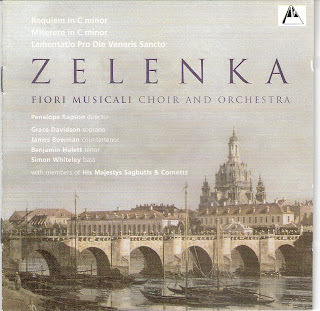 A 1995 Supraphon recording coupled the Requiem with another of Zelenka’s sacred choral works heard on this disc, the Miserere. That disc has since been deleted, which is a shame since, for all the performance’s rough edges (and there were many), it had a vivid sense of involvement which is lacking from these English forces. Besides the polished and committed instrumental playing, the choral singing seems superficial. There’s no doubt that Penelope Rapson has enthused her singers to deliver Baroque music with real vigour, but something has been lost along the way, while a sense of forced jollity results in the fugal second section of the Miserere sounding as if it was performed on horseback. (If jollity seems an inappropriate quality to find in settings of such misery-laden texts, one must not overlook what Rapson so rightly describes as Zelenka’s “quirkiness”.) Perhaps the choral group is a little thin in numbers – the booklet lists 23 names, but are they all singing all the time? - and possibly lacking vocal maturity, but the blend and balance (and, I regret to say, the intonation) between voices and trombones (which often seem merely to be doubling the vocal lines) is decidedly unappetising. A warmer acoustic – after all the booklet note promises “a magnificently sonorous texture” – and a little more choral bulk would, I suspect, have yielded infinitely more rewarding results. While the choral forces leave something to be desired, the quartet of soloists adds real distinction to the disc. A sombre, but by no means dark-hued Simon Whiteley, reminds us that it is a requiem rather than something lighter in his impeccably poised “Mors stupebit”, while “Te Decet” finds Benjamin Nulett and James Bowman offering as graceful a pairing of voices as one could imagine. At one, both musically and vocally, this would be the real vocal highlight of the disc were it not for the presence of Grace Davidson. Her unassumed purity of tone, natural vocal delivery and instinctive feel for the idiom, is a joy to behold. Her truly heavenly delivery of the “Gloria Patri” from the Miserere elevates this disc from the undeniably interesting to the unmissably arresting. Thank you for drawing attention to a CD we recorded several years ago. Life is full of coincidences: I stumbled across your most interesting, informative and entertaining blog the very day after I played another concert with the wonderful James Bowman in Oxford. Nice to know that enchanting playing travels all the way to Singapore. Will certainly continue to see your impressions and ideas on this page. With warm greetings from Berlin.